The City of Goleta retained Dyett & Bhatia to preparing a new Zoning Ordinance to implement General Plan policies and the Local Coastal Program, replacing the County ordinance that has been used since incorporation. The ordinance will include standards for the physical development, growth, and conservation of resources. It also will establish detailed rules for the application review process. It will protect Old Town and other community assets. The Zoning Ordinance Program also includes a Supplemental EIR and Local Coastal Program permitting procedures. 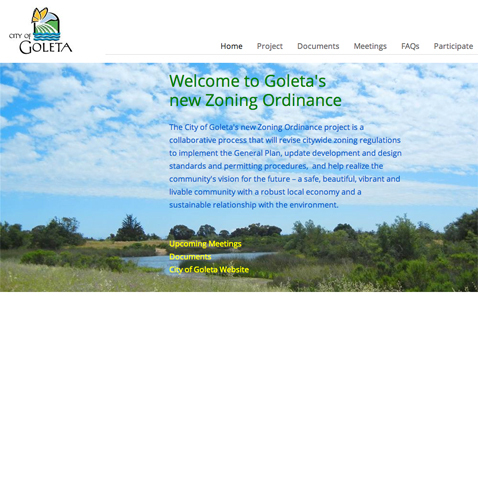 More information is on www.goletazoning.com, a website designed and hosted by Dyett & Bhatia.